Interesting form of Stone crop that has foliage that takes on brilliant red/purple tints in cold weather or with drought stress. 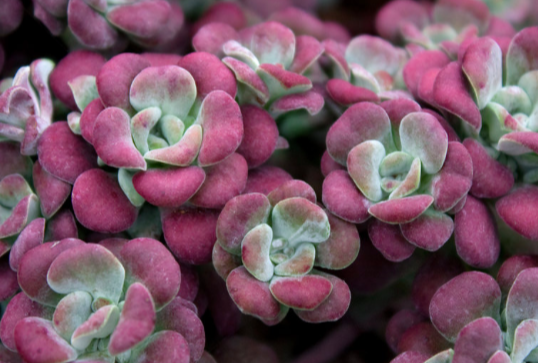 Powdery blue foliage is arranged in rosettes at the end of 3″ stems. Starting with the outer most leaves the vivid tints become most apparent in mid-late summer through winter. Red stems support clusters of gold/yellow flowers in early summer. Excellent pollinator plant as are all Sedums. Easy to grow in any soil that drains reasonably well. In regular ground double dig the soil to incorporate oxygen into the soil and avoid compaction. It will spread to multiple feet across in short order. In rock gardens it can be a little rambunctious around delicate plantings. Give it room and plan for it to spread. Great in seasonal containers, troughs, rock walls. Light summer water speeds the growth rate- it also inhibits the bright color. Oregon Native Plant.